It’s the second week of October, which can only mean one thing...bring on pumpkin everything! This is my favorite season, especially living in New York. Everyone is trading in their iced coffee’s for PSL’s and for the first time in a long time, you need a light jacket during the day. Each year, I like to savor the season and make a bucket list of items to enjoy Fall to it’s fullest. So, today I’m sharing my Fall Bucket List for 2018. You can read my previous bucket lists here, here and here. 1. Central Park is always on the top of my list. I love walking through the park seeing all the leaves changing colors. A MUST if you live in New York City. 2. Spend a cozy night at home watching movies. Here is this year’s Hallmark lineup. 3. Bake pumpkin bread from scratch. Although the mix in a box from Trader Joe’s is equally good. 4. Drink spiked cider from one of my favorite rooftops in the city, Birreria at Eataly. Each year they transform their space for the season. And this year’s theme is a Fall-inspired Italian Countryside. 5. Go apple picking at an orchard in upstate New York. And of course, eat apple cider donuts. 6. See the Broadway Musical Wicked. This has been on my bucket list since moving to New York and I just haven’t gotten around to going. Making it happen this year! 7. Visit Bite Beauty Lab here in the city to create my own custom lip color for Fall. Perfect for a Girls’s Night Out! 9. Plan a getaway to the mountains. Colorado is beautiful this time of year and I’m over due for a trip to see my family there. 10. Celebrate my 4 year Anniversary of living in NYC on October 10th. Still feels surreal that I get to call this place home. Here’s a recap of YEAR 1 and YEAR 2. What’s your favorite thing to do during FALL?! Earlier this Summer I made a quick overnight trip to Boston. And I’m finally sharing my guide on things to do + where to eat + where to stay. This was my first time visiting Boston and I wasn’t sure what to expect. But I can say this, Boston was a place I could definitely see myself visiting again soon. It had the appeal of big city living but feels very quaint and easy going. Everyone I came in contact with was very friendly. And I kept finding myself saying the words: “I could live here.” I think that says a lot about a city that I’ve only spent 24 hours in. I probably should visit during Winter months before I make any plans on moving there, lol. Airbnb - This ended up being the best option for a last minute trip. I was really shocked at how pricey hotels are in Boston. Maybe it was due to the time of year?! But we got really lucky and found a nice Airbnb in the South End area to stay for the one night. South End is such a quaint and charming area. The streets are tree lined with beautiful Brownstones on each side. It’s an easily walkable area and there are lots of shops and restaurants nearby. I highly recommend staying in South End. 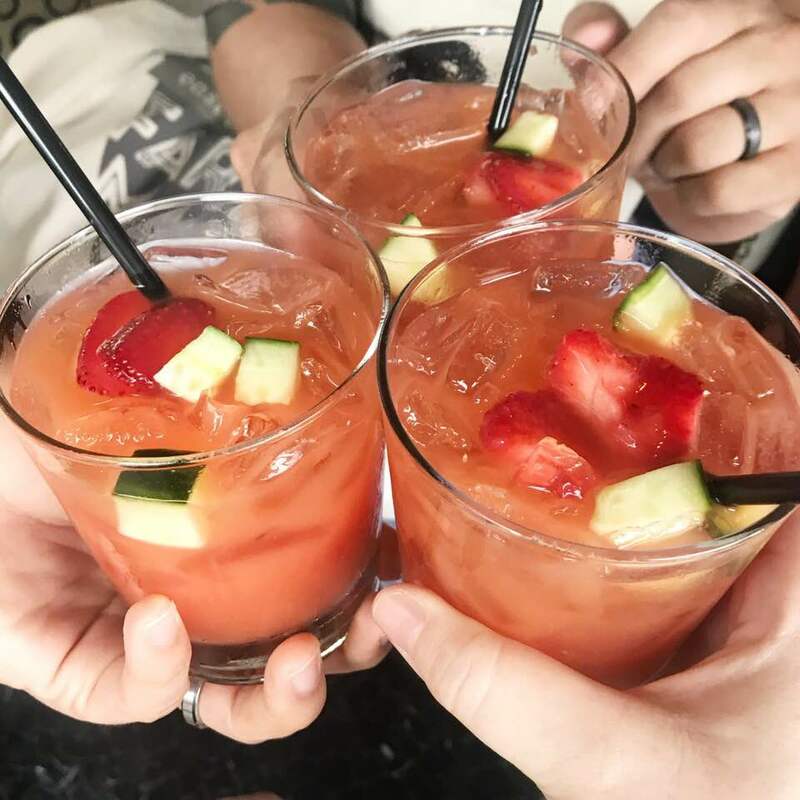 Barking Crab- This lively outdoor restaurant is a MUST! It’s casual dining with picnic table seating and views of the Boston Harbor. Order the hot crab dip and raw oysters. And the Frose to cool off! Barcelona Wine Bar- Perfect spot for Dinner with friends or a Date Night Out! This tapas style restaurant is located in the South End. They have an extensive wine & cocktail menu. I recommend reservations, they are typically on a wait even on a weeknight. Order all the tapas (seriously) But definitely the mussels and charcuterie board. 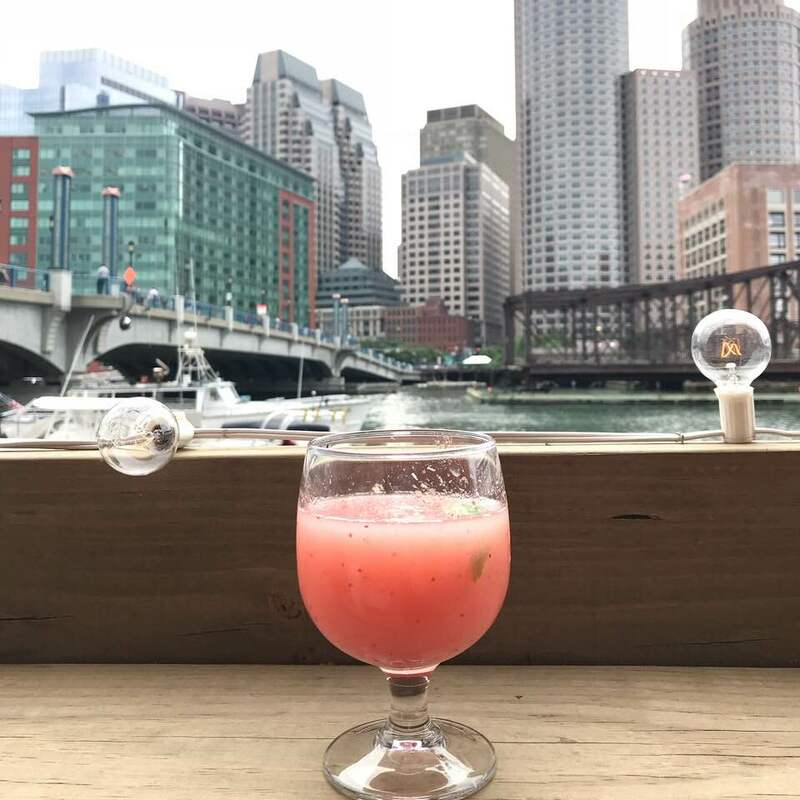 Temazcal Cantina- Great spot to grab drinks in the Seaport District area. The restaurant is gorgeous on the inside and has amazing waterfront views of the Seaport. Cafe Nero- Best coffee shop with even better coffee. Cafe Nero is a chain coffee shop with locations all over the city. I loved the coffee so much, I purchased 2 bags to bring home with me. Order the cold brew! China Town- Although it’s not the size of the one in New York City, it’s still a fun area to explore. Downtown/Theatre District- Home of the Paramount Theatre and host of many Broadway Shows. A must see in person. 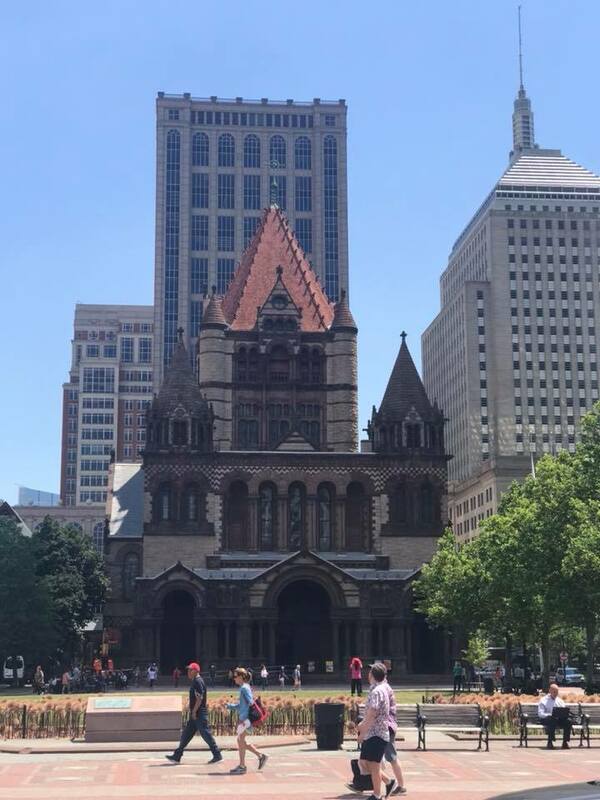 Copley Square- This area is where the Boston Public Library, Trinity Church and several other landmarks are located right in the heart of the city. Definitely one of the most picturesque parts of the city. Seaport District- This is an new up and coming area with lost of restaurants, shops, art and where a lot of local events take place. You can also walk along the waterfront and see all the boats along the harbor. 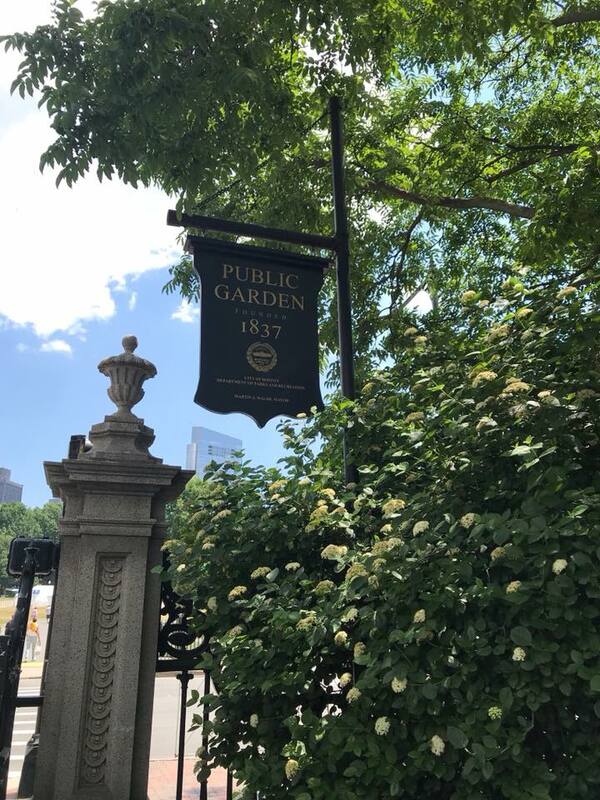 Boston Public Gardens- A beautiful public park adjacent to Boston Common. And home to the famous Swan Boats. So that’s my quick travel guide for Boston. I loved my stay there and would definitely go back and explore more of city. There is so much to see & do! I’d love to hear from you if you’ve ever been to Boston! What would you recommend for my next visit there?! Comment below. Now that I’m in my mid-thirties, I’ve been taking skincare more seriously over the past few years. And I’m always looking for NEW products/brands to try in attempt to perfect my skincare regimen. So, when I kept seeing TULA all over Instagram and everyone was raving about it, I was intrigued to learn more. What initially caught my attention was that, TULA products are made with probiotics. And knowing what an important role probiotics can play in our bodies internally, I realized that they could equally be as great when it comes to our skin. My skin type is combination; oily in warmer months and dryer during winter months. Especially with living in New York City and being exposed to the sun and pollution daily, I find that I need to change up skincare routine often. So a little over a month ago, I ordered my first TULA 14-day trial kit that included four different products. Unfortunately, this kit is no longer available online. However, I was able to find this one that’s similar and is also a starter kit with four products to try (also includes a cosmetic bag). After using TULA skincare products over the past few weeks, I have definitely noticed a difference in my skin overall. Today, I’m sharing my honest review of the products I used. Purifying Cleanser- This has quickly become one of my favorite cleansers. I use it daily, both A.M. & P.M. It’s gentle but effective in removing makeup. It has a light scent that smells AMAZING! I love how this cleanser leaves my face feeling fresh and clean without drying my skin out. It’s been great with my sensitive skin. And a small amount of product goes a long way. Pro-Glycolic 10% pH Resurfacing Gel- I tend to have oily skin especially in warmer months. So using a toner is essential in my skincare routine. I love how this toner is alcohol-free, so it doesn't feel harsh at all on my skin. After cleansing my skin, I apply a small pump of product to my entire face using a cotton pad. This resurfacing gel has helped improve and even my skin tone and minimize oil build up. Revitalizing Eye Cream- Initially I was applying the eye cream twice a day, however I found it to be not as absorbent when applying makeup over it in the morning. So, then I tried applying it just at night and letting it absorb while I was sleeping. And it definitely made my under eyes feel more hydrated in the morning. I also noticed my eyes were not as puffy after waking up. Hydrating Day & Night Cream- I love how hydrating this cream is. It definitely helps to bring skin back to life and gives you a natural glow. And I like that it’s a day & night cream all in one. I think this will be one of my go-to creams during winter months to keep my skin hydrated from the wind and cold temps. What makes TULA different from other skincare brands? Probiotics are used as the base ingredient for all products. 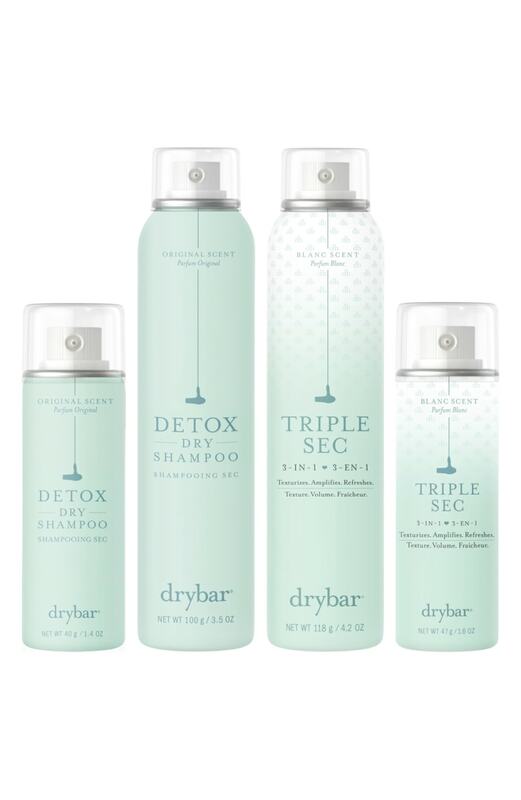 Products are 100% free from phthalates, parabens, propylene glycol, petrolatum, gluten and mineral oil. This is NOT a sponsored post. All opinions are my own. This is a brand I truly love and wanted to share my honest review of products used. Get 15% OFF your purchase by clicking here and signing up for TULA emails. Also, FREE Shipping on all orders over $50. Happy Sunday!! Starting this LDW weekend off by stocking up on some of my favorite beauty products. If you haven’t heard already, SEPHORA is having their Beauty Insider Appreciation SALE for all Beauty Insiders, which is their loyalty savings program. If you're not a Beauty Insider, don't worry! It's FREE and super easy to Sign Up. But hurry, the SALE ends Monday Sept. 3rd! I’m sharing some of my go-to products & a few NEW products I'm excited to try! Urban Decay Naked Skin Concealer- I only use two brands of concealers, and this is one of them. This concealer is great for everyday use. It gives full coverage, is buildable and lightweight. And I love the applicator. If you're looking for a brightening concealer, try this one. It cosmetic CC+ Cream w/ SPF 50- I’m not big on foundation so this has been my all time favorite product that I use daily. It gives you light coverage almost like foundation without the heavy cakey feel. And gives you a natural look plus evens out your skin tone & has SPF 50. I wear the shade Light. If you buy ONE thing from the Sale, buy this! NARS Velvet Matte Lipstick Pencils- In the colors: Dolce Vita (dusty rose) and Cruella (deep red). These are two of my go-to lip colors for Fall. I love these lip pencils because they're rich velvety colors that apply smoothly and last for hours. If you haven't tried NARS lip products, you NEED to! Tarte Double Take Eyeliner- I've been using this eyeliner for awhile now. The cool thing about this eyeliner is that it's double ended giving you a pencil and liquid. So you can easily use it for daytime and nighttime looks, depending on what type of look you're going for. Tarte Toasted Eyeshadow Palette- My favorite eyeshadow palette! The colors are warm, super pigmented and long lasting. I love the color combinations within the palette and the shades are perfect for everyday or dramatic evening looks. St. Tropez Gradual Tan Everyday Tinted Lotion- I love this tanning lotion because it gives me just enough color without looking fake. It can be applied everyday and is buildable depending on how dark you're going for. And because it's a lotion formula, it also hydrates your skin. I like to apply it right out of the shower and then let it dry while I'm doing my makeup. Who says you can't be tan all year long?! Summer Fridays Jet Lag Mask- This has been on my list of skincare products to try, for awhile now! 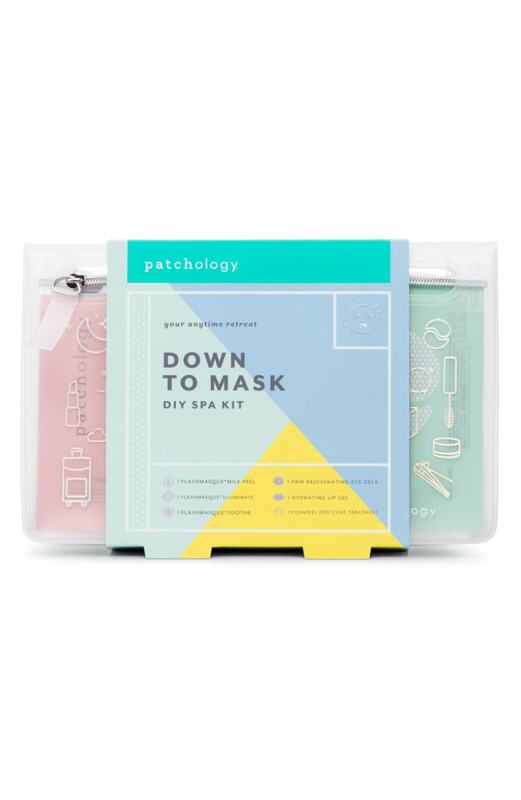 It's a hydrating face mask for all skin types that's supposed to be like a drink of water for your tired, stressed-out skin. Need I say more?! It's been featured all over the internet as well as major magazines and seems to be a beauty favorite for many. Excited to try it out for myself and see what the hype is all about. Kopari Coconut Deodorant- Recently, I started making the switch to natural deodorant and so far, I haven't found one that works for me. So, when I found out that Kopari (a brand I already love) has their own natural deodorant, I knew I had to try it! So this will most definitely be added to my cart! Briogeo Don't Despair, Repair! Deep Conditioning Hair Mask- Since I have color treated hair, I like to do at home hair treatments to keep my hair from looking dry and dull. This weekly treatment restores your hair's moisture and helps to prevent future damage. I'm already a fan of Briogeo's leave in conditioning spray so, I'm excited to try their hair mask. Tell me what's on your MUST HAVE Sephora Shopping list!! Comment below. I distinctly remember the 6 months leading up to my 30th Birthday and the immense pressure I felt to have it all figured out. And by all, I mean LIFE. Thirty seemed like this magic number. Where everything I had ever mapped out for my life, would somehow all start aligning and fall into perfect place. And here I am, more than half way through my 35th year of life and I'm far from having it all figured out. In fact, in most areas of my life it feels like I'm starting over. Lately, in conversations with friends I've noticed that many of us are going through similar changes in our lives. And the one thing we all have in common, is that we're in our early to mid thirties. There's something about this decade that causes you to have uncertainity about yourself and also makes you question your path in life. And you often find yourself asking the question: "Am I happy?" In your 20's, you graduate from college, start choosing a career, date with the intention of marrying one day, make friends with everyone and start to discover who you are as a young adult. In your 30's, you no longer feel fulfilled by just working a job to earn a paycheck, you find that spending time with yourself is just as important as being with someone else, your group of friends get smaller as you become more selective and you really begin to discover who YOU are as an individual. And all of this somehow starts to unravel little by little and you realize that life is really just getting started. Your thirties are a time in which you feel more eager to not settle for the things you once wanted and to go after the things you never knew you needed. I myself, can vouch for this. Over the past few years, I've undergone many changes in my life. But it's brought me to a better version of myself ultimately. You see, your thirties are a time in which you can REINVENT yourself. It all starts with discovering who YOU are and figuring out what IT is you truly want in life. And it looks different for everyone. Sometimes it's moving to a new city. Maybe you're contemplating quitting your job to pursue a passion project. You may choose to stay single to focus on your career. Or maybe you want to settle down to start a family. You may discover that you want to travel rather than stay in one place. And you may find yourself starting over in several areas of your life. However, no matter what changes your thirties may bring, you owe it to yourself to figure out what truly makes you happy. And even if you feel the immense pressure by those around you to do things a certain way, don't apologize for wanting to take a different path. My best advice for anyone going through this phase of life, is to be open and honest with yourself. Throw out the life timeline you once created for yourself and just live in the moments, days and months ahead. Don't be afraid to color outside the lines. Nobody tells you that your 30's will be some of the most challenging, significant, best years of your life that will bring you so much strength and growth. But I promise, you will be so much better for going through it all. Happy Friday, y'all! If you don't know already, the Nordstrom Anniversary SALE went LIVE today to the public. The sale runs from July 20th-Aug. 5th, but previous to today, ONLY card holders had access to the SALE. This is one of the biggest sales of the year and a great time to stock up on everything from Fall wardrobe pieces, shoes, accessories and beauty products. And since I'm no fashion blogger....I'm sharing with you all, the best of the best beauty bundle deals you can purchase from the sale. And the best part is, FREE Shipping on all items. UPDATE: SOLD OUT as of 7/22....will update if Nordstrom restocks item. UPDATE: As I was writing this post, this item SOLD OUT unfortunately. Nordstrom may re-stock it, so I'll keep an eye out and give updates in the coming days. In the meantime, you can still purchase the individual one here. Hope you enjoyed this round up of beauty bundles from the Nordstrom Sale. I would love to hear about the items you'll be shopping for. Comment below. Even when it's hard to walk away from something, doing so allows you to be reminded that life goes on regardless. You should NEVER stay stuck in something. And yet we often feel compelled or obligated to stay in our complicated relationships, dead end jobs or unfulfilled friendships. Which begs the question: WHY?! Honestly, I think it has a lot to do with FEAR. Fear of letting go. Fear of moving on. Fear of what we may leave behind. Fear of the unknown. So, how do you let go even when you know it's the best thing to do? This is an area in my life that to be honest, I still struggle with. I'm good at holding on to things even when I know they aren't good for me. And I'm even better at letting things stay the same for fear of the "what if's". But as I've gotten older, I have learned that letting go doesn't have to be a bad thing. It often means freeing yourself from the things that are no longer serving you. And it can also be exactly what you need to move forward in your life. So I'm sharing three steps that have helped me deal with letting go in life, and maybe can help you as well. The first step, is to admit that something needs to change. Maybe you feel like you don't have many options right now, but there is always a choice that can be made. Easier said than done, I know. But ask yourself, am I happy? And then ask yourself, what can I do about it? Also, remind yourself that you can't do the same thing over and over again and expect different results. Change is hard, but once you make the commitment to do it, you've already taken the first big step in letting go. Second, I think you have to be willing to be open to what comes after you let go. Which is often scary to embrace the unknown. But it can also be liberating if you allow yourself the opportunity. Commit to your decision made and let life happen. Don't let the fear of what could happen stop you from pursuing a new outcome. This is where the real work begins, because it's much easier to allow ourselves to stay in a comfortable place rather than be open to new possibilities. But if we do the work, things often start to fall in place over time. Lastly, I think that you have to be confident in your decision moving forward. Remind yourself everyday if you have to, why you made the decision to let go in the first place. And then place your trust in the process. Don't beat yourself up over the what if's, or bumps along the way. Sometimes the things that lie ahead of us test us the most. And as you move forward, don't look back unless you plan on using that glimpse as motivation to keep going. Otherwise, stay the course and know that life is what you make of it. I would love to hear from you all, and what has helped you in situations of letting go? Comment below.